The apartment has been carefully restored, in keeping with its original character and to create harmony between the exterior and interior. It has a large kitchen/living/dining area with open fireplace. There are views of the countryside from every window, a tranquil and peaceful ambiance. The farmhouse has been attentively restored. : The farmhouse apartment has been attentively restored with original material to maintain its character. Natural stone such as travertine and marble in bathrooms. Handmade terracotta floor tiles. Postion on a hilltop, with farms surrounding. : Position amongst the countryside surrounded by olive groves. Spectacular views towards Siena and Monte Amiata (highest mountain in Tuscany). Traditional Tuscan landscape with rolling hills and cypress trees. The apartment has 2 bedrooms one which can be used as a twin, and also a mezzanine floor with 2 single beds. Separate laundry and storage facilities available. Bath towels and linen provided. Books and sightseeing information available in the apartment. The swimming pool is opened from beginning of June to end September early October weather permitting. Idyllic spot in the middle of rural Tuscany but still close to all the Tuscan highlights. Highly recommend having Anna cook you a traditional meal or two. Loved every minute of it. Thank you for this lovely comment. It was a pleasure to have you stay in my apartment. We spent a lovely week at Podere Cavoni. The Crete Senesi region is great, in parts quite different to the rest of Tuscany. The property is very authentic. Rustic and secluded, yet has all the modern conveniences that we come to rely on (excellent WiFi, dishwasher, washing machine, coffee maker). This made the stay so comfortable. It is also very well situated. An hour and a bit from Florence, 20 minutes from Siena, and close to numerous other wonderful towns and villages. We particularly liked San Gimignano and Pienza (beautiful place). All in all this is highly recommended if you like peace and culture. Where to begin? The place is beautifully decorated and furnished, with lovely bits of artworks and books. Every window gives a magnificent view of the stunning landscape, and the beautiful, fragrant gardens. The swimming pool is large and very clean, it is shared with the other owners, but there were plenty of times, when we had it all to ourselves. Lots of thoughtful touches inside, with delicious welcome pastries and a bottle of homemade olive oil as a gift. The perfect Tuscan getaway, we couldn’t recommend it more warmly. A well furnished apartment that offers convenient access to Tuscany but also a quiet retreat. We especially enjoyed the walk directions Carmelita provided. Friendly neighbors and a refreshing pool. We (family of 3) just spent a week at Carmelina's lovely home. We used it as a base for day visits to Siena, Montepulciano, Arezzo, Cortona, etc, and also just sat and basked in the beauty of the surrounding countryside. The apartment is very authentic and special; a lot of thought and love clearly went into it. The little "village" that is the farmhouse was also nice, complete with about five cats of varying dispositions. In all, a wonderful stay, highly recommended. Gorgeous setting in the heart of Tuscany. Of the many Agriturismo's we've stayed at over the years, none can compare to the views at Podere Cavoni. The spacious common area hosted many memorable meals, made possible by the well equipped kitchen. Navigating the road to the Agriturismo does take some getting used to, but the peace and serenity make it worth the journey. The apartment is located in the Crete Senesi, 15kms south-west of Siena. 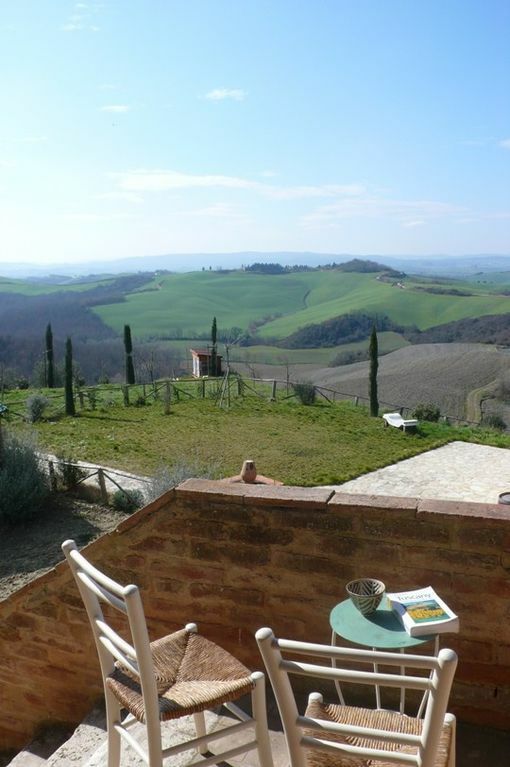 It has extensive undisturbed views across the Tuscan countryside and to the skyline of Siena. Shopping at Taverne D'Arbia 7km or the medieval town Asciano 10kms. Only 30km from the wine area of Montalcino where the famous Brunello wine is produced. Rapolano Terme (thermal baths) 18kms; southern Chianti area 15kms. The area is not touristy, you will find yourself surrounded by local farmers and people from local towns that visiting the countryside on the weekend.